UPDATE: These stores may not be as new, but they're still just as awesome as when they first opened, so check them out for a shopping Sunday Funday. This story was originally published on April 12. New York is known for its "anything can happen" attitude, high-profile style stars, insane restaurants, and, of course, impeccable shopping. And while a new store can come and go faster than, say, a presidential candidate, we found three just-opened boutiques that we know are here to stay. Let us introduce you to an ultra-chic French import, a new Nolita charmer, and an eclectic L.E.S mainstay (all conveniently located near our favorite cool-kid hang-outs). You can bet they're all well curated and chock-full of personality—not to mention stocked with merch that will make your pupils turn to hearts. So, naturally, we got the lowdown on their creative owners, and just what to look for when you pop in (other than us, of course). Click through for the deets on a trio of brick-and-mortars that'll be wreaking havoc on your lunch break in no time. .
264 Bowery (between Houston and Prince streets); 212-675-2346. Unless you've got a style routine as locked down as Anna Wintour, you're going to want a little variety. 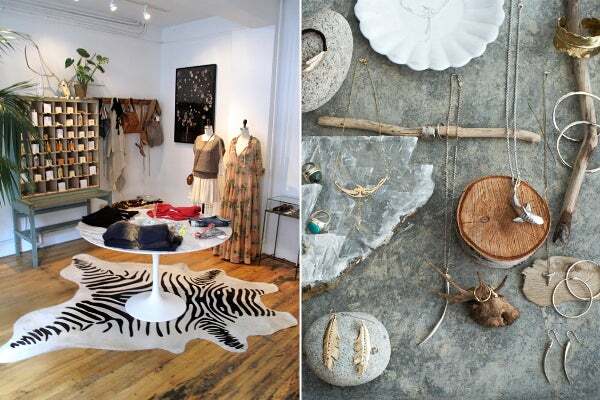 And newly-opened Dagny & Barstow is a great place to get that mix that owners Emily Titelman and Meredith Blank display in their own dress and have expertly translated into wares that reflect the shop's Bowery 'hood. One example? This adorable pixelated sweater (and they've got tons of springtime shorts to match)! Who is your client and what does she come to the store to find? "Our client is anyone who wants to stand out from the crowd and who is looking for something special. We were getting really tired of seeing the same designers at so many stores, so pride ourselves always having a selection of really unique and interesting pieces from up-and-coming designers. If a customer is looking for fun prints, a statement bag, or even a great basic tee that you can't find anywhere else, D+B will definitely be able to help." How does your store embody your neighborhood and what does it bring to it? "The Bowery is such a vibrant neighborhood, unlike any other New York City shopping district. The mix of new cultural and shopping destinations alongside more traditional Bowery retailers from the restaurant supply and lighting districts creates an incredibly diverse landscape. Our personal styles always mix designer and vintage pieces and much like the nieghborhood, that mix is really embodied in our store. We are committed to stocking an assortment of wearable pieces at a wide variety of prices so there's something for everyone." What would we be surprised to find in the store? "In addition to our offering of women's clothing and accessories, we sell some great affordable art (we've partnered with ArtStar.com and also have works from other artists such as Baron Von Fancy and Sarah Applebaum) as well as a small selection of men's clothing." What do you hope the shopping experience to be? "We just want customers to feel really comfortable and at home in our store. We love it when people come in to shop and end up hanging out for a while." What are you stock-full of for spring? "Colorful scarves and Hawaiian print tops from Swash, industrial-chic jewelry from Noise Girl, mix and match Giejo bathing suits, Thierry Lasry sunglasses, and some amazing perforated leather pieces from Stouls." Describe the interior of your store — how does it reflect your aesthetic philosophy? "We love the history of our space; not only did it used to be Lenny Kravitz's nightclub, Kos, but it was featured in a Berenice Abbott photograph. We kept many of the nightlife elements including the bar, a fabulous chandelier, and a DJ booth that we use during events. We built our store around those elements, and really let our clothes and art decorate the rest of the space." Devastee Printed Sweater, $375 (exclusive to Dagny & Barstow), available at Dagny & Barstow. 1170 Broadway (at 28th street); no phone; opening Thursday, April 19. Owners Gildas Loäec and Masaya Kuroki have been cooking up something extra special in Paris and finally, they're making their well-curated wares available in the U.S.. As it lands on Broadway, Maison Kitsuné brings with it sophisticated work wear, amazing designers like Michel Vivien (see those divine wedges up top? ), and just another reason to envy the French. Only bad news is, you've got to wait until the 19th to start shopping. "I imagine curious people with a sense of style seeking fashion pieces that are classic, timeless and made from the highest quality." "The essence of Maison Kitsuné is all about lifestyle — we created the boutique to bring together fashion, music and design. As there is a eclectic mix of hotels, bars, restaurants and fashion in the neighborhood, NoMad was a natural fit." "As Maison Kitsuné has a certain style and direction, we hope shoppers feel their experience is unique, memorable and obviously, love it, so they keep coming back." "For women: city shorts, feather printed, pleated dresses and skirts, classic oxford shirts, beautiful piped blazers and for men, irregular striped T-Shirts, checkered button downs, khakis, and elegant tartan blazers." Describe the interior of your store — what are some aspects that reflect your aesthetic? 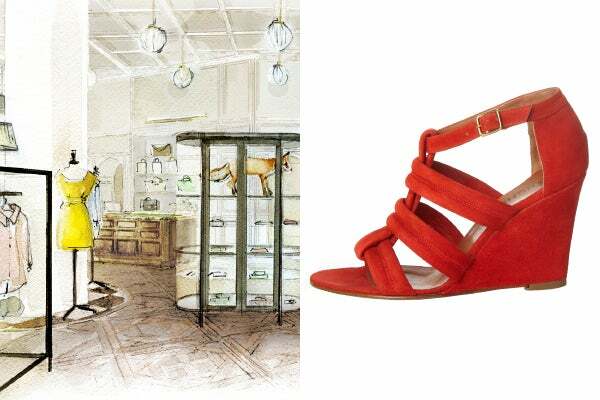 "The boutique evokes a classic Parisian vibe — very elegant and inspired by the 7ieme arrondissement. It's intimate with touches of bourgeois elements throughout and custom made furnishings that add a modern edge." Michael Vivien wedges, will be available at the store's opening, April 19. 181 Mott Street (between Kenmare and Broome streets); 212-925-1200. As the sun comes out, so does the spring time clothing: laid back, easy to pull of, and comfy (yet obviously chic). 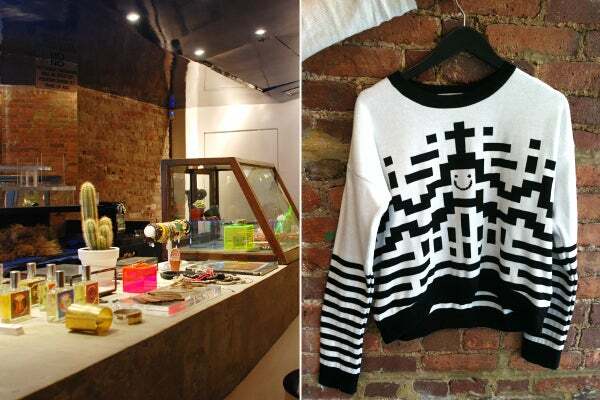 So there's no better time to welcome new boutique, Warm, to the Nolita neighborhood because it's got all that and more. And there's no better owner than Winnie Beattie to be at its helm. Having lived in the neighborhood for many years, Winnie knows it's just the place for her beautiful shop, unique duds, and (oh yes!) open garden out back. Plus, it's got its own scent that smells like sunkissed skin. We're sold. "We have a huge mix of girls, but it's definitely for the urban-hippie type, the girls ho lives kind of a big city life and who lives in a more urban environment, but who definitely has a love of travel and adventure and beach and mountain. We called it "warm" because my husband and I spend our lives in pursuit of all things warm, so it's kind of for like-minded people like us." "I've lived in this neighborhood for 18 years, so I know it very well, and it's also why I did the store here. When I first moved here, there were all these really cool stores that you wanted to hang out in, not just shop in. Even if they didn't have something new in, I'd go by every Saturday just to see who was hanging out in the shop or what the sales girls were wearing. And even though there are still plenty of great places to shop here, I don't know if there's any kind of hang out space. So to me the store is really of about community. We have a back garden so we're going to be doing manicures in the summer, and showing kid's movies, and doing arts and crafts for kids. I have two boys, so I know it's impossible to shop unless they're distracted, so we're going to be doing fun things in the back that I miss as a girl who likes to shop but has little extra things too." "We have a really hard to find brandsthat can be very precious kind of dirty rock n' roll hippie too, if you style it the right way. We also have my favorite lip balm from Hawaii as a kid that's like $2 — we have a huge range of price points because it's more just things me, husband and my kids love." "I want it to be old-school, when people knew your name when you walked in — they knew your size, they new your style, they knew what you would like. I just want it to be personal and interactive. Every single piece I've bought has a story behind it, my friend in Ibiza who hand paints her dresses, or whether it's my friend Rogan Gregory who handmade some beautiful serving bowls for us, every piece has a story so I just want people to know what they're buying and why they're special." "Anything beach, anything vacation, and anything for basically when it's 70 degrees and sunny. Anything in the spirit of holiday. I want everything to feel like you're always on holiday, even if you're going to work in the city." "We wanted to find a space that was imperfect, because that's also the whole vibe of the store. We did not want an architect or an interior decorator. Most of the stuff is from our house. All of the rugs that are in here were in our home, and some chandeliers, and the aloha sign was above my dining room table for years. It's a lot of things that were used and have lived in our whole lives. Very few of the interior things are new."